ROUNDHOUSE ROUNDUP: THE BLOG: Get Your Grube On! The Flabby King is gone but the "Outlaw Senator" is back! Former state Sen. John Grubesic is back. He's writing a weekly guest column for Capitol Report New Mexico. His first outing is classic Grubesic. He discusses why he didn't do what many lawmakers do when they leave office -- become a lobbyist. "Often, political retirement packages are funded by returning as a lobbyist. I faced two significant obstacles in launching a successful lobbying career. "The first was my turbulent relationship with the sitting governor and the second was the idea of returning to curry the favor of people I had served with turned my stomach, caused me to have nightmares and started me drinking again. No, I did the drinking without needing a reason, but I did have a recurring nightmare that involved Tim Keller, Cisco McSorley, Dede Feldman, a broken calculator and an angry baboon that looked and sounded a lot like John (Wertheim)." Pure gonzo. That's our Grube! 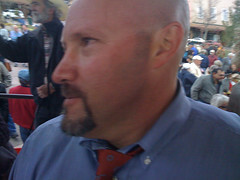 Grubesic is a Democrat who represented a Santa Fe district and now works in Albuquerque as a lawyer. He writes, " ... as a criminal defense attorney, I am bound to bump into some of my old comrades eventually." Also doing a weekly guest column for Capitol Reports is Brigette Russell, who ran against Rep. Brian Egolf in the last election. She'll be working as a bill analyst for House Republicans this session.